Is it hard for you to walk on glass? Is it more difficulty if the trip on the glass bridge encircles the edge of towering mountain near-vertical ? For many seem a scary adventure ,especially who afraid of heights ,but it looks from far away an unique experience. 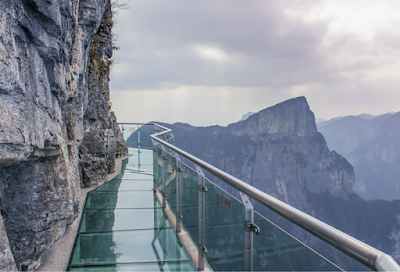 This unique experience offered by new glass bridge around Tianmen Mountain in China at an altitude 1430 m, which opened in 2011 , and gives visitors adventurers of course an exceptional experience , its floors and fence made of transparent glass with a thickness of 6.4 cm gives you an amazing view of the deep Valley and surrounding mountains. Malaysia is one of the coolest and most beautiful South-East Asian countries, therefore, it has a prominent place in the hearts of the world tourists who visited or heard about , it is in the forefront of the favorite destinations for travelers in the region, no wonder it is a city with different cultures materialize in one meaning "Hello everyone" , if you are planning to travel to Malaysia, here are 9 things you should know before leaving. Often mentioned food in Malaysia as one of the main distinguishing features of this country, whether you will take up your food from the stalls of street vendors on the side of the road or in fancy restaurants. The capital "Penang" is one of the best places to tasting Malaysian food and popular dishes from all over the world such as India, China and Thailand.